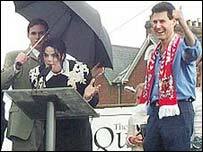 Celebrity spoon bender Uri Geller has ended his friendship with Michael Jackson over anti-Semitic comments he allegedly made in 2003. Geller told BBC Radio London's breakfast show that, if the story was true: "I don't want to hear from Michael Jackson ever again." "I'm Jewish, I was born in Israel, and I will never forgive him," he said. Jackson has made no comment about the remarks, aired for the first time last year, during a legal case against him. The comments, in which Jackson reportedly referred to Jews as "leeches", were aired by US TV Good Morning America in November, which said they were on an answerphone message. They were denounced by Jewish groups, including the Anti-Defamation League, which called for an apology. Geller had Jackson as his best man when he renewed his wedding vows in 2001 saying: "I chose Michael because he is a good friend and I wanted him to experience a Jewish wedding". He often spoke up for Jackson in public and invited him to Exeter City Football Club, where Geller was co-chairman. The mystic also helped set up the Martin Bashir documentary Living with Children - in which he admitted to sharing a bed with a child. Jackson later said he had been "utterly betrayed" by Mr Bashir. Geller told BBC London he also felt betrayed by the journalist, and believed Jackson, who was last year cleared of molesting a young boy, to be entirely innocent. But asked what their relationship was like with singer now, Geller said he would not forgive him, if he had made anti-Semitic comments.